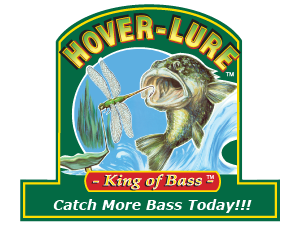 The HOVER-LURE® King of Bass® fishing system is designed for use in weeds, heavy surface mats and above the water surface. The naturalistic design of every lure presents an ideal target to largemouth bass waiting for prey under cover of well lit lily pads and weeds. Bass, being superior predators, tend to stay close to edges and most often lurk suspended under mats. They seek out areas which provide a diversity of weed growth and plant species. Large mouth bass are found most often under cover where they can conceal themselves from prey and predator. The design of HOVER-LURE® is no accident. Largemouth bass are sensitive to and wary of unnatural sounds and movements. Unlike and crank bait, HOVER-LURE® emits the least amount of noise with its smooth floating motion. Bass are sight feeders. From the low light of their under cover hiding spot, HOVER-LURE® presents an easily seen back-lit target as it floats near the weeds. Bass have highly developed light and color sensors and, while they might not see fine detail at long distance, they are very sensitive to natural colors and patterns. The naturalistic design of HOVER-LURE® is crucial for getting a largemouth bass to strike. The effectiveness of HOVER-LURE®'s visibility, motion and realism is most evident when fishing close in or near areas that provide maximum feeding opportunities. The HOVER-LURE® is Easy To Assemble. See How! Check out our Video Library! Watch the HOVER-LURE® in ACTION!